While visiting Peru for the month of December, I was lucky enough to meet a few makers working out of Fab Lab Lima. It was very inspiring to meet with them and learn more about both personal and community-wide projects going on. Having never been to any sort of makerspace outside of North America, it was a very interesting cultural experience as well. I plan on sharing about a few of those makers here, and I’ve also written a bit about my own reflections of making and my experiences in Peru on my blog, Adventures in Making. One project that caught my eye was this fully operational Ironman helmet made by Luis Ernesto Flores Olazo. Up close the helmet looks metal, but it’s actually made out of foam. The combination of both digital and analog craftsmanship is really what makes this project interesting. Learn more about how he made it below. 1. Can you tell me a bit about your involvement at Fab Lab Lima? Well, I started working at Fab Lab MET one year ago as an electronic engineer, designing and developing interactive biostructures. Then I joined the “Xtreme Training” program at Fab Lab UNI. Currently I’m taking the Fab Academy certification, which is the highest specialization in digital fabrication given at the same time in many fab labs around the world, directed from MIT. 2. I saw your Ironman mask while visiting the space. Can you tell me more about how you made it and what was involved in the process? 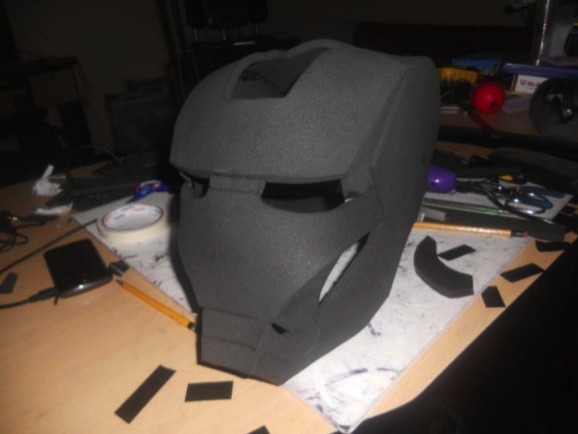 My Ironman helmet was built 80% by hand and 20% with digital fabrication. I had to experiment with different materials. I used servomotors, LEDs, and electronics. The process basically consisted in making the 2D development from a 3D model of the helmet using Pepakura software. Once I got the 2D development I could print it using a traditional 2D paper printer. The next step was cutting each paper piece in order to get them separately. Then I traced the pieces in another material, in this case I used EVA foam. Once I got each piece in foam I pasted them as a puzzle in order to obtain the 3D physical model in foam. After that, I had to apply three or four layers of polyurethane resin in order to harden and get a glossy finish. Furthermore, I applied fiberglass where the servomotors would be put. Finally I used sunglasses and LEDs for the eyes and a 3D-printed mechanism based on two servomotors to control the opening angle of the faceplate. I control the entire helmet with an Arduino Uno. 3. What inspired you to build it? Since I was a child I’ve always found robotics very interesting, and ever since, I’ve been very curious to work with this kind of stuff. However, answering your question I started this project because I was bored. By the time I built the helmet I had already quit my old job and the Ironman movie was coming, so I decided to build my own Ironman helmet! 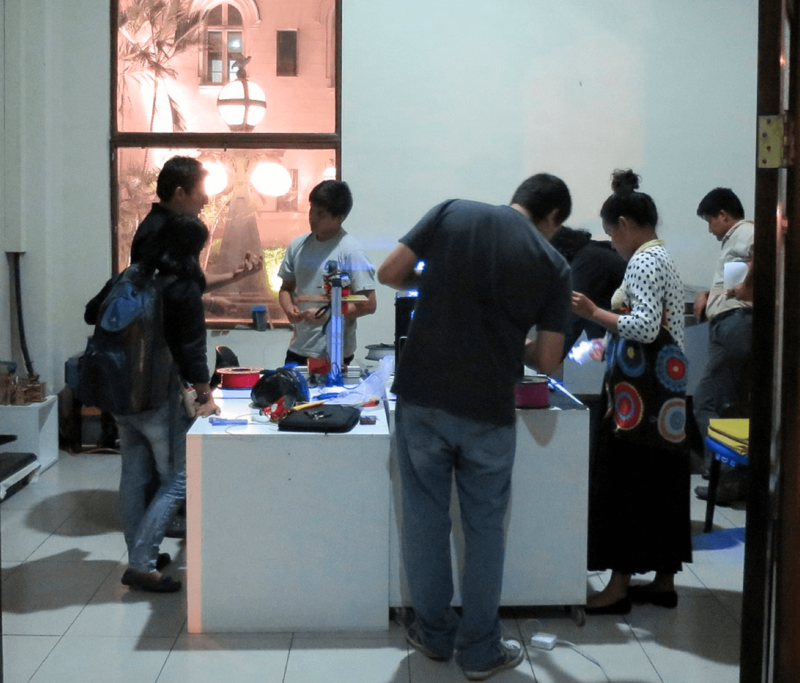 4) Can you talk about some of the other projects you’ve worked on at Fab Lab Lima? Sure, I’ve built my own 3D-printed cyclops visor from X-Men 02. I’ve also worked on a big organic and interactive structure used as a showroom of what is possible to make in a Fablab. I’ve also worked on developing a 3D printer for alternative materials like clay. 5. What’s up next for you? Now I’m working with some friends on a modular multirotor (quadcopter) using digital fabrication at Fab Lab UNI and developing a workshop for building musical robots at Fab Lab MET. At Fab Academy I’m implementing a multi-agent fabrication system — that means building two or three mobile robots and making them work together in order to fabricate something. The most exciting project I’m involved in is called Fab Starter. This began as a personal project for offering products that I built using digital fabrication in order to finance one cause through a donation-recompense system. Now it is becoming a platform for more makers who want to do the same and could be supported by the worldwide fab lab network. The most interesting thing has been the good responses from people because they want new and unique products which could be made with digital fabrication. If you want to hear more from Luis, you can follow him on Twitter @lefolindo.